Notes And Updates: This article was written in 1997. We no longer recommend the Tow-V-Aire. While it was a very early Braking System, the technology has advanced considerably from what this system offered. Check out our Braking pages for the latest State of the Art Braking Systems. Call or email for more information. With all the talk about braking on tow vehicles, especially after the BC government decided to legislate mandatory braking, I thought it would be a good time to review one system that I had the opportunity to see demonstrated while on a recent trip to Florida. I discussed with the manufacturer the various systems on the market and reviewed their strength and weaknesses. The April issue of MotorHome magazine has a review of 8 systems, not including the one I tested. Most motorhome chassis manufacturers require braking on the towed vehicle when towing a car or truck (dinghy) weighing more than 1,500 lbs. In the April 1997 issue of Consumers Report (pp 62-67) only 13 out of 186 vehicles, weighed in under 2,500 lbs, with another 10-15 weighing between 2,500 and 2,600 lbs. Of course, not all of those 25 vehicles are suitable dinghies, and many RV'ers tow pickup trucks and Jeep-like units, that far exceed the weight limit. The solution to the safety problem, is awareness. We never even think about the fact that our Bounders have weight and braking limits, because we have so much room for storage. Some of us choose to carry extra items in the dinghy (coolers, bikes, extra clothes etc) and the Bounders brakes have to stop all of it. Most travel just under the gross vehicle weight rating, and we are beginning to realize that stopping our Bounder together with a dinghy, can be a challenge. Dinghy braking systems will become a reality, either by law or by informed choice. Many states in the USA are beginning to enforce laws that are already on the books regulating dinghy braking. BC may be the first Canadian province to take action, requiring braking on vehicles over 1400 kg. (3087 lbs. ); many other jurisdictions are actively proceeding in this same direction. The system I saw demonstrated, called Tow-V-Aire, is comprised of an electrical harness connected to the Bounder brake switch (to know when you are braking) and the battery (for operating power). In the dinghy, a portable, one-foot square unit is placed on the passenger compartment floor. This unit contains a small air compressor, storage tank, a flow regulator, emergency bypass and some operating solenoids. An air coupling connects this unit via an air hose to the air ram cylinder that is attached to the foot brake pedal and secured to a bracket attached to the floor of the dinghy. A conventional electrical connector attaches the dinghy to the Bounder together with a breakaway switch for safe stopping in the event that the dinghy becomes unattached from the Bounder. All components are high quality and display good workmanship. The system operates by the air compressor maintaining pressure in a storage tank that is regulated and released to the ram cylinder, every time you apply your brake on the Bounder. This system activates the brakes on the dinghy, just as if you were in the dinghy and braking to stop. There is no tampering with the hydraulic brake system on either vehicle, it is simple to connect and disconnect, and it works on any type of dinghy. In the event that the dinghy breaks loose from the Bounder, the breakaway switch utilizes the dinghy battery to power the system and the unit applies full brake force to immediately stop the dinghy in an emergency stop mode. To describe the system is much more complex than to see it operate. It is simple; the on-road demonstration showed how easy it is to connect and use, and how effective it is in stopping the dinghy. Typical installation time is four to six hours. 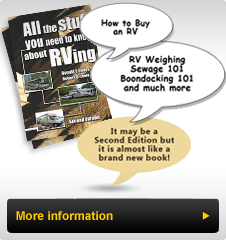 Note: See the RV-PartsPlus.com Braking Tab web page for up-to-date improved toad braking systems.